Oh, TIFF. You always ignite my Festival Style Green Room Fantasy. You arrive with a flurry of stars and excitement, spin the city into a whirlwind of festivities and glamour, then just as quickly… WHOOSH! It all goes away, leaving us breathless in your wake. But while you’re here, you capture the imagination, spoil us with star sightings and films that transport us to other worlds and we bask in the positive attention our city gets! We Torontonians try to be on our best behavior, to make a great impression and as always, this year we nailed it. 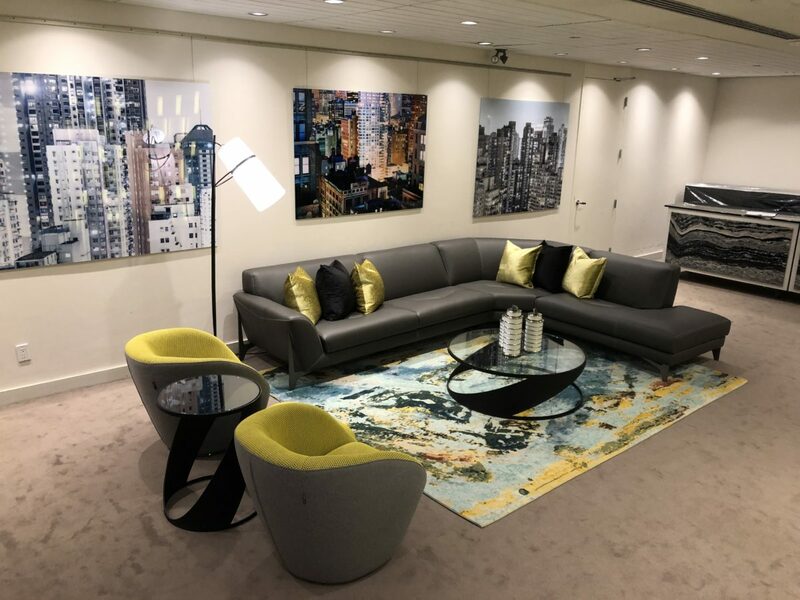 A cozy seating area was created with Lumas Gallery Photo art, Roche Bobois furniture, Union Lighting lamps and decor, Homesense pillows, Weavers Art rugs, and Cambria Canada bars. Designed by Jane Lockhart Interior Design. Once again, we had the opportunity to add a little drama of our own to the festival. 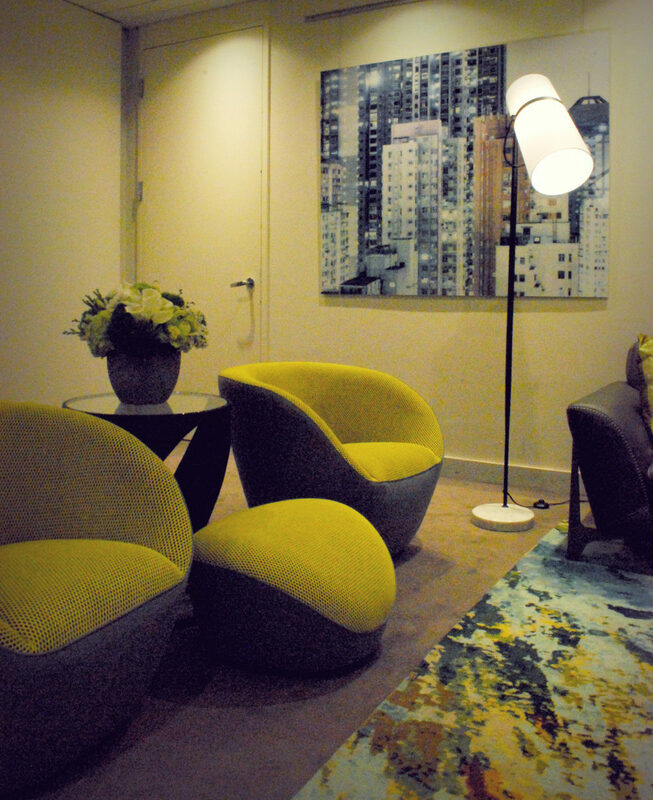 Our firm worked with Festival Style Magazine designing the (secret) Green Room in Roy Thomson Hall. Our partners, Roche Bobois, Lumus Gallery, Weavers Art, Union Lighting and Furnishings, Cambria Canada and Homesense contributed luxurious furnishings, rugs, serving bars, artwork, and décor. Like magic fairies, we all turned up at once, cast our design spell on the room and left it ready to dazzle the Gala guests. For security reasons and out of respect for the guests we only come back at the very the end of the festival when it’s time to clear it out, like a theatre after all the patrons have gone home. This year, TIFF’s theme is Lightbox, a translucent surface illuminated from behind. Our interpretation of this for the Green Room included inspiration from Lumas Gallery and their contribution of fantastic photo art. The walls featured large acrylic coated photos of skyscrapers in the city at night where all the boxes (apartments, offices) light up from within, giving a lightbox effect. Weavers Art contributed the bass notes, the area rugs for the design, anchoring vignettes of furnishings that still allowed the vibrant colours and designs of the rugs to flow through. Modern, leather sectionals from Roche Bobois anchored the space and chic side and coffee tables seemed to float over the floor. Did the stars connect with our design? I wonder if Lady Gaga liked the Edito armchairs. These funky pieces have chartreuse fabric that looks like it was crocheted over grey flannel. Did Viggo Mortensen and Mahershala Ali toast their movie, Green Book with a glass of wine at the ever-so-chic Cambria Bar? Did Festival Style Magazine cover girl, Claire Foy hold court surrounded by pillows, propped up just so from Homesense? Maybe Chris Pine admired the photo collage of Tokyo while he grabbed candy or popcorn from the console from Union Lighting and Furnishings? Did the stars align, or just sit back and relax in the green room? It’s all just part of the intrigue, not knowing who sat where or whether they felt special in the space, so I get to imagine their reaction. It’s fun to project yourself into that world of film and fantasy, even if having a conversation with the brilliant, Octavia Spencer will only happen in my dreams. But the secrets of the Green Room will always be just that, secret. So, now a week later the Green Room has been restored to its previous form and the flurry of Hollywood-style glamour has left the city, building their buzz anew for Oscar season. In our own way, we hope we’ve reached out and touched the stars through great design. Oh, and Ryan Gosling? We’d design your home, anytime. Call us.